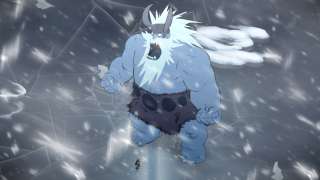 Jotun is one of only a few games that actually made me feel small. Faced with killing gigantic Norse titans called Jotun, you have to dodge and attack with precise timing or else be crushed swiftly and without remorse. I got a chance to play Jotun with its Creative Director William Dubé, who told me about the art and design directions of the game while giving me a few tips on how to survive. Watch the video above to see Jotun's beautiful hand drawn art style in action, and you can find it on Steam starting today.